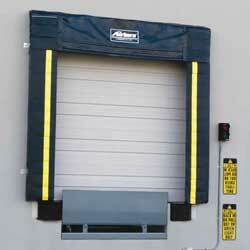 This Head Curtain Dock Seal is a padded seal with a full width head curtain to accommodate a wide range of trailers. The head curtain is supported by Scotchply™ stays and rigid tubing to maintain shape and slope to provide adequate drainage. Heavy elastic straps ensure the head curtain conforms to the top of the trailer. The dock seal frame is made from kiln dried pressure treated lumber for long life. A steel frame is optional. Custom polyurethane foam is designed to conform to the shape of the trailer. The foam’s superior recovery characteristics ensure that the foam will return to its normal shape and size. The foam is chemically bonded to the dock seal frame to ensure long life and maximum strength. A wide range of fabrics and colours are available at different performance levels. To ensure the dock fabric is not damaged, air exhaust ports allow for air to escape when the truck compresses the foam. The ports are designed to allow air out while preventing moisture from getting in. Bright yellow stripes aid in accurate truck positioning at the dock. Faiborn developed a high quality urethane finish to ensure long life and high visibility for many years. Downtime is always a problem, we can put together a plan customized to your needs to keep downtime to a minimum.